An old notebook in the possession of Marie Pennock who She kindly gave me permission to copy it. This notebook contained the records kept by Mr. Fauncey Green who was the township clerk for a number of years. The house where he lived was eventually purchased by Lee and Nellie Stiers. Nellie was Marie's sister. She told me that schools normally had three terms in a year, two months in the fall, four months in the winter and two months in the spring. I have also added any information I could find about the deeds, plat books, tax records and newspaper items mentioning any of these old schools. The pictures are from people I interviewed during two summers in the 1960s, who had attended these schools. At the time of these records, there were 12 schools in Center Township. The numbers were said to be in the order in which the schools were officially established and a building erected. The land for this school was purchased from D.A. Elliott in an1846 deed to Trustees of Center Twp for $3.00. On April 20, 1863, $275. was appropriated for a new building and new furniture. The building committee was T. W. Phillis, A. Jordan and S.M. West, E. W. Slater and Jas. Gilliland were paid $271.75 on March 7, 1864 for a building. One mill was to be levied for 6 months for the school and ¼ mill to be levied for furnishing it for a full year. In 1879, $200. was levied to repair or remove school #1 to a new site. April 21, 1879, a committee of five studied moving the house to a new site or repairing it. In that year they leased 120 square rods from Matthew Smith for $40.for as long as it was used for school purposes. Smith was to pasture the land as long as it was unfenced in which case he was to mow it. Next, they decided to repair the building and to pay for it. Teachers: who are listed as having taught in this school were: Joseph Phillis $1.–1863. John Wagner was paid $18.in 1864; Mary E. Collison was paid $35 –1863. Daniel Brown was paid $5 for fuel. Mary E. Smiley was paid $100 --1865. A. H. Bolinger--1881. J.W. Phillis --1884. M. Smith--1885. J.K. McGashan – 1885.G.T. McMannas 188.J.C. Peregoy 1887 [some payments were listed and some not; and some years are not included.] The Morgan County Democrat reported that J C Peregoy closed his school on March 12 of the year 1887. Board members from #1 in 1881 bought 12 desks. #1 first appeared in the reassessment plat books in Morgan County. Hackney School was on land obtained from John Sherlock in 1865. On August 11, 1868, George W. Cunningham and his wife Salome P. sold it for $10. “Commencing at a stone in the village of Hackney, it being a corner and on line between G.W. Cunningham and William H. Baker thence West on said line 14 rods as long as used for school purposes.” A levy of $550.for a new schoolhouse and site was proposed at a board meeting on April 20, 1868. Local directors were to procure a site and dispose of the old house and equipment In 1875 the school lot was fenced for $20. In 1885, a motion was adopted to enlarge the grounds and build a suitable house. The committee members were: J.B. Conn, W. Baker, J. J. Ludman, William Dearth and E.A.E. Smith. In 1886 thirty dollars for 10 rods along the old ground and 12 rods along the Unionville Road. $592 was appropriated for this .and the old house was advertised for sale. They bought 12 new seats and 2 starters from F.D. Fowler for $55.. A committee also bought 14 new seats and 2 starters from Mr. Fowler the carpenter for $55, in that same year. The old school house at Hackney sold to John Davis for $18. One-half down and the remainder in 6 months with 6 % interest. In 1887 bonds were issued for 1 year at 6% interest as follows: $200 Mrs. E. Cowles, $150. E. Pilkington, $100 Jessie E. Rowland, $14. A.W. Burlinghame, Thomas Kane and Co. were mentioned in this list but it is unclear whether they were the ones handling the bond sales or whether they actually bought a bond. In the Morgan County Democrat of July 13, 1896 the following item was found, "William Blackburn commenced an 8 week term of a normal training school at Hackney for the benefit of teachers and advanced scholars who wished to engage in the work of teaching." The August 21, 1896 Morgan County Democrat had the following item, "Many new teachers are employed without certificates. Unless they pass tests schools will be without teachers as last fall." And on Sept 9, 1896, it was noted that "School opened with Miss Nellie Parmiter of Bristol and 25 students. She will also conduct a writing school on Tuesday Evenings this winter." February, 1887. Literary was organized at Hackney. The debate topic for the evening was: "Should the township be redistricted?" Front row left to right: Eddie Clark, Junior Martin, Ray Morrison, Judy Hall, Jeanette Townsend, Mavis Marshall, Carol Reed, Barbara Conn.
Second Row, left to right: Thurmond Shepherd, Jimmy Moore?? John Thompson, Dean Thompson, David Allen? Cecil Clark, Norma Silvus, Dorothy Wagner. Back Row, left to right: Ralph Rucker, Johnny Wagner, Bobby Combs, Norma Thompson, Marjorie Taylor, Ina Belle Marshall, Carolyn Hilton. School #3 - Center Bend. 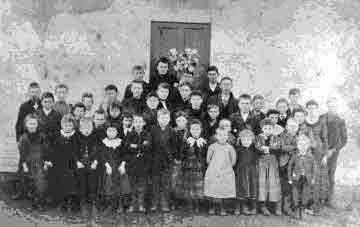 This school was the smallest in the township in 1863 and 64. They bought land from Philander Andrews in 1845 The reassessment Book Values were: on ½ acre in 1880: $300. 1869: $100. 1890: $200. They paid $175 to build and furnish a new school house for #3. The building committee was T. Trimble, Ludwell Petty, and Hiram Andrews. This occurred on April 20, 1863. Four hundred dollars was levied for a new building in 1877 and local directors to be the building committee and to dispose of the old building. School grounds were to be fenced and use the proceeds from the old building for a new fence and spring. There was a letter to the editor of the Morgan County Democrat concerning this written by E.C. Wayman in 1856. The teachers for #3 were: Lucetta Heskett. She was paid $60 March 10, 1863. She was paid $45 August 14, 1863. John W. Taylor was paid $36 in April of 1864. Martha A Kidd was paid $48. in 1865 and Elizabeth Newton was paid $68. Edgar Atkinson was listed as a teacher in 1897. P Trimble was paid for fuel on various occasions… $8 in 1864. J.C. Mercer was paid $120. for labor on the school. Board members listed were: Jacob Dearth: 1881. C.C. Andrews: 1881, James Dearth: 1884. T.F. Carroll: 1885. There was a literary society at this school, which was described as “well-attended as well as pleasurable and profitable.” In February 1887, “Center Bend Literary Society has been discussing prohibition and talk of organizing a temperance society,” according to the Morgan County Democrat. In 1887, “Gulliver’ reported that the Center Bend Literary was a success because each fellow took home his own girl. On October 31,1863. $28.25 was paid to William Clark for furnishing school #4. It was noted that$125. was needed to repair the school house as recommended by the committee. Mr. Phelps, Mr. Humphries, and A. Brown were the committee members. Teachers at # 4 were Wm Newton $66.00 1863; Watson Russell $90.00 paid in 1864; George Kapple $39.00 in 1864; Watson Russell was paid $100.00 in 1865 and Jennie Krapps was paid $25.00 in 1865. Board Members (three- year terms) in District #4 were James Dearth in 1871, Nathan Silvus 1881; J. H. Dearth in 1884 and Henry Dearth in 1885. 1. Arthur Morris 2. Clarence McHenry 3. Frank Ferris. 4. Charles Chapman. 5___ . OnIe Pergoy 7. Tennie Emerson Lewis. 8. Cecil Morris 9. Carrie Ferris 10. Myrtle Morris. Front Row. 1. May Silvus (sitting) 2. Mary Sherlock 3.Florence Silvus 4. Orvil Morris. 5. Maggie Morris. 6. Lee Stiers 7. Pearl Peregoy 8. Madge Stiers 9. Clara Silvus Morris..
Willie Farus, Victor Dearth and Lewis Dearth the little boys seated on the ground. One half acre of land owned by George S. Corp was deeded for this school. It was in section 28 and the plat book lists its value in1869 at $200, by 1890 it was $500. .The land bordered on William Trimble’s land on the south east corner June 18, 1884 the deed was signed by J.S. McKelvey, George Kappel, and George S. and Josie B. Corp.
Board Members were listed as: John Wainwright in 1871 and 1881. Stillman Sanders in 1884 and John Tennent in 1886. The picture below(and the information comes to us courtesy of Myrtle Campbell who told me that in that year (1918) Maude Ryerson was the teacher, although she is not in the picture. A school down over the hill toward the old Rucker place was once called the Powell School. It was disbanded and the new one was obtained from Elijah Davis and Charles Wilson and Calvin Powell were the signers of the original agreement for land for this school. Others who were witnesses were Charles Stokes, George D. Shaults, and Philip Kappple, J.P. August 12, 1849 the land gotten from Calvin Powell, 30 cents to be paid per year for a period of 30 years by school directors. Recorded April 1, 1850. School directors at this time were Alexander Conn, Calvin Powell and Charles Wilson. On February 27, 1869, Alexander Early was paid $5.00 24 square rods were leased on the Sailor Road between Alex and W.C. Early. It was located in Section 9. Its valuations were listed thus: 1869: $300. 1880: $175.and in 1890: $500. On April 15, 1867 $500 was raised for purchasing the site and building. The committee to do this was WC Early, John Stokes and J.B. McNabb. Also they were to dispose of the old site and building. On April 20, 1868 they paid $50 for furnishing the house. School there was taught by Kate Smith at one point. The season closed on Marc 25, 1887. She was returning also for the spring term. Another report in the local paper said that B.F. Welch had been hired to teach for the third year in a row on April 1887. 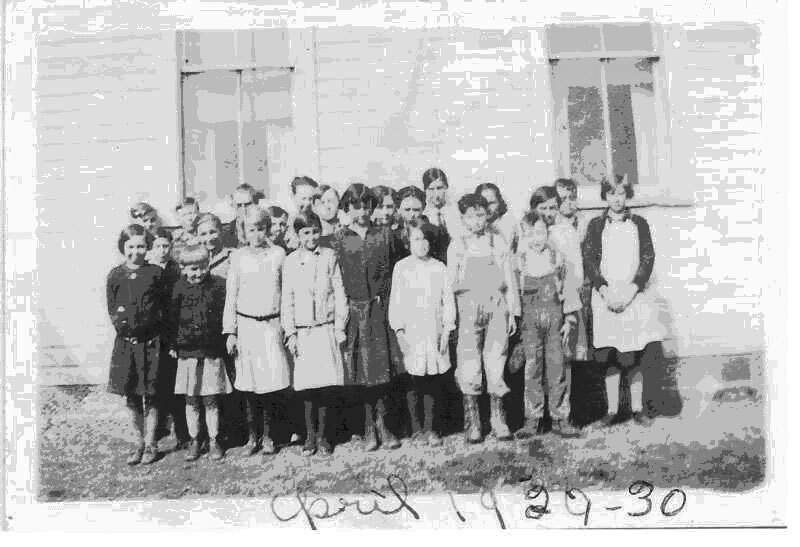 From the Morgan County Weekly Herald , April 22, Last term of Early’s School closed with Dwight Stevenson as teacher. 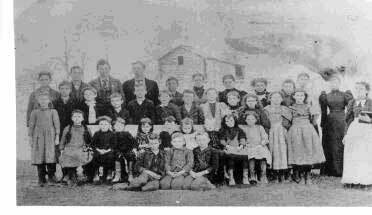 The school was located near the highest point in Center Township. The old log schoolhouse was very near the township line north of the old Cross Roads Presbyterian Church. January 3, 1866, land was obtained from Alex Reed. In part of the north quarter of section 7. It was listed as thirty rods for school purposes. In 1866 $15.00 was appropriated for seats in the school. B. Jackson was paid $100 upon contract to build the new school. Reed’s School is shown on the atlas of 1879 in section 7. In March 1864. Sarah Martin was listed as a teacher but the amount of her pay is not shown. Feb 26, 1865 appropriated on a contract of $100. for building and repairing school #7. Peter Bollinger, D. Drake and A.H. Reed were on the committee. In 1867. Elizabeth Reed leased ¼ acre of the land on the Marietta Road for school purposes. Joseph Keever was the clerk of the board which leased the land for $1.00 on Nov. 6, 1889. Board members were listed as John Thomas in 1871; Jasper Wickersham in 1881, Robert Moore in 1887 and J. Wickersham in 1886. In 1899 the district purchased 1 acre from Benoni Allen for $60.00. The first time this school is mentioned in the 1900 Platt book. Its value was listed at $500. Mattie Rose was the teacher at this time.. The names of pupils have been hopelessly scrambled but these people were said to be in the picture: Melvin Ferguson, Warren Hastings, (flower), Richard Ferguson. ________Charles G. Wickersham. Dora Cordray Mary Reed, Leona Lyle, Owen Bamfield Jane Murphy, Lalura Wickersham., Warren Hastings, John Lyle, Charlie Bell, John Ferguson, Chas. G. Wickersham. 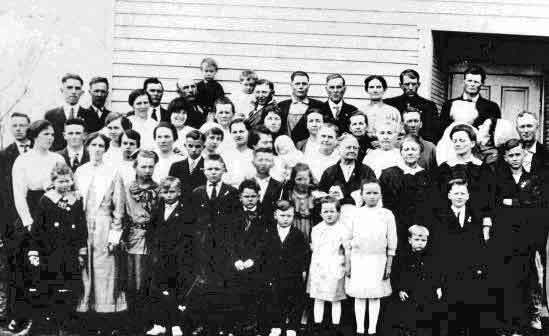 George Richards, Charlie Peck., Lora Shuster, Ed STEWART, Mary Drake, Effie Murphy, Minor Moore, Alice Wickersham, Melvin Ferguson, Jim Ferguson, Mattie Stewart, Levi Murphy, Jessie Lyle, Grace and Forest Reed (twins) Vinnie Cordrey, Rex Schuster, Herschel, Widkersham, Beryl Ferguson, Bessie Moore, Nellie Peck, Ida Stewart, Bessie Moore. A Grantee Deed was obtained from Samuel Endicott for $1.00 in 1851, to directors of school #8: Ezekiel Emerson, Thomas Blackburn and Samuel Anderson, the school directors. A lease on May 11, 1851 from Samuel Endicott, to be as long as used for school purposes was drawn up for ½ acre of NW Quarter of South West Quarter of section 25., near the Cumberland Grade. It was agreed before Philip Kapple, J.P. Ezekiel Emerson, Thomas Blackburn and Samuel Anderson were the school directors. In an 1869 plat book this school was in the same place on land owned by Leonard Scott. It was shown in an 1880 plat book and valued at $20. in Section 25 on land of Charles W. Bucy. In Section 12 , 1849 there is a lease from Elijah Jordan by Daniel Slater and John Spicer directors for school #9. 12 ½ cents annual rental was signed before Philip Kapple, P.P. The board paid Daniel Slater $155. for building and furnishing this school on Feb 16, 1863. They leased the site from Henry Morris for $8.00 on April 1863. The directors were Henry Morris and Nathan Essex. In 1877, they levied $100 to repair the school house. ½ acre in 1900 was $100. in section 25 on land of Letitia Bowie. Teachers who taught at this school were Jefferson Jordan who was paid $71.in 1863. and in 1865.John Tyson taught in 1864 and E.T. J Jordan taught also in 1864. G.W. Peregoy is listed for the year 1867. Orin McKee and George Kappel are last on the list. In the Morgan County Herald it states that Kappel closed his 7th term on March 7, 1887 with an exhibition. In the Morgan County Democrat of 1887 it says that George Kappel closed his 7th term of school on the 27th with an exhibition. Board Members were Henry Morris: 1871, Joseph Stevens 1882 and J.S. Jordan in 1884.The board paid Jefferson Jordan $24.14--June 30, 1863. J. Hughes was paid $5.00 --March 14, 1863. Jacob Groves was paid $15.20 for stove and pipe in April of 1863. W.C. .Early was paid $1.67 for recording the lease. E.T. J. Jordan paid $27.69 for tuition September. 21, 1861. J. Henry was paid $8.00 for the site. John Tyson paid $80. for tuition on February 27, 1863 and $60. in June 1864. Jefferson Jordan paid $115.20 February 29, 1865. School #10 - Center School. On October 19, 1846 land was leased from Edward Petty for use as long as it was used for school purposes. The directors were Ebenezer Waterman and Henry Nickols, Jr. The lease was recorded by William Coburn, who took Nickols place and was done before Wm. Glines J.P. It was shown in the 1859 Platt book. $500 appropriated $500 for building a school house on April 16, 1866 and appointed David J. Roberts, Thomas Pedicord and James Blackburn as the building committee. Also they were to sell the old house and apparatus Thomas Pedicord was paid $6. for fuel March 16, 1863.The new building was also to be used for Center Township purposes. In 1881 school #10 was reported in need of repair. J.B. Conn, John Tennent and Joseph Stevens were to examine it to determine exact needs. $110 was the estimate given to do this. The school was fenced in 1885. James Gilliland was struck off from this district and added to #6. Erastus Parcell was struck off from #11 and added to #10 upon request. Teachers who taught at the Center School were: E.A. Collison paid $37. on February 1863. Mary E.. Colison in June 1863. R.C. Blackburn paid $124 for tuition in 1864 and 65; E. Hawke taught at this school in 1867 and was paid $57.. Edgar Atkinson was the teacher in 1897. Board Members were : John White, H Shuster, J.H. Ludman in 1881, John Devitt 2nd in 1885, and E.A.E. Smith in 1886. Joseph Phillis land to School District #11 leased unto David W. Green, George Peregoy& George Clark., Directors. “Land commencing at a stone a few rods south of where the Cumberland Grade crosses Jacob Heckman’s East line thence south 8 perches thence E 6 perches thence north 8 perches and west 5 perches to place of beginning . (1/4 acre) Part of the west side of the North East Quarter of the Northwest quarter of section 14.” The lease went 50 years for school purposes starting September ,1844. Annual Rent was to be one cent. William Glines, J.P. In 1886 there was a writing school conducted here by E. L. Magers of Reinersville. The interest was very high. 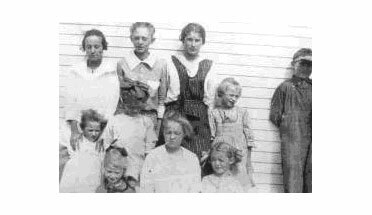 First Row:,, L/R Lourene Morris, Ernestine Hutchins-Clark, Hope Phillis-Morris, Ester Parrish-Mincks, Delores Simcox—Paxton, Elsie Palmer-Huck, Clarence Phillis an Walter Morris. Second Row: L/R Karl Mahaney, Glen Mahaney, Doyl Hutchins, Charles Sherlock, Lura Morris-Lawrence, Russell Clark, Ruth Palmer-Garrett, Faunna Phillis-Combs and Ruth Hutchins. Third Row; L/R—Emerson Phillis, Robert Barnhart, Clayton Allen, Robert McCoy, Wavelene Morris and William Parcell. Mrs. Maud Hutchins was the teacher. 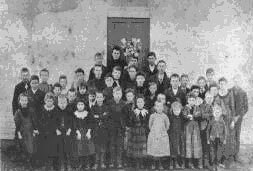 This picture of the students of Centerville School was taken in 1917. Back Row left to right. 1. Clint Taylor. 2 John Williams 3. Frank Williams. 4.Bill Parcell holding William. 5. Riley Morris, holding Lura Morris. 6. ___-Williams 7. G.K. Phillis. 8. Mary Phillis. 9 Lou Taylor 10. Jack Slater. Third Row, left to right: 1. Ear Grandstaff,( back of Clara Morris. ), 2. Glenna Williams 4. Nellie Parcell 5. Leora Taylor? 6. Carrie Hutchins 8. Widge Simcox 9. Maude Devitt 7. Minnie Williams 10. Werenzie [sic] Simcox 11. Charles Sealock. Bottom Row, left to right: 1. Edna Morris. 2. Lola Slater, 3. Ida Bell Devitt. 4. Dean Slater 5. Layton Williams 6. Carl Williams 7. Denzil Slater 8. Avenell Haines 9. Mary Haines Gannon. 10. Emerson Phillis. 11. Ivan Morris. Front Row, left to right: Phil Bucey. 2. Bill Phillis 3. Henry Phelps 4. Phil Dearth. 5. Lorlie Wagner. 6. Charlie Sherlock. 7. _______ 8. Ivan Phillis 9. Mary Sherlock. 10. Ivan Simcox. 11. Marion Clark. 12. Ethel Dearth. 13. Ima Phillis 14. Leota Williams. 15.__________. 16. Jesse Clark. 17. Dossie Wagner 18. Jessie Philis. 19. Helen Carrol. 20 Iva Clark. 21. Herman Hilton. 22.___________23. Clara Wagner. 13. Josephine Wiley. 25. Guy Phillis. 26. Hoy Hilton. 23. Clara Wagner. 24 Josephine Wiley. 25. Guy Phillis 26. Hoy Hilton. 27. Jim Phillis 28. Pearl Slater. 29. Bertha Oliphant Blackburn 30. Bessie Wagner. 31. Lillie Wagner. 32 Nancy (Widge) Simcox. 33. Leora Taylor 32. Warrne Barnhart. 33.___________34. Mabel Smith 35. Wayne Slater. 36. Myrtle Slater 37. Cleo Motz 38. _________39. Kate Hilton. 40 Mary Wagner. 41. _______42. Forest Stiers 43. Mrs. H.W. Gordon. 44. Mrs. Jane Busey. 45. Clint Taylor 46. ______ (Little boy with knee pants) 47. Julie Taylor. 48. Jack Barnhart 49. John Henry Barnhart 50. Wilbur Simcox. 51 Johnny Pierce. Teachers: Stillman Sanders paid $50. Feb 1863, Cynthia E. Leonard, W.C. Oliphant was paid $100. April 1864; Mary Sheldon was paid $51.in 1864. Henry Peregoy was paid $8.00. Davis Oliphant was paid $10 for fuel. William Gray was paid $4. for repairs. M.E. Peregoy was paid $59. in 1867.Directors were J. E. Phelps 1881-1885 and Ed Phelps. In 1887 Mr. M.C. Thornton closed the school on the 25th of March, said the Morgan County Democrat. * Tuition was paid by scholars transferred from Meigs Township and Waterford township and other areas, whether they may have officially been in another township but they lived closer to the school in Morgan County, Center Township. On September 17, 1877 Directors of the school adopted on motion Ridpath’s School History of the United States as the official history text. Spencerian System of Penmanship was also adopted. A committee was appointed to investigate the condition of school house #4 and report back to a special meeting. The committee was: Mr. Phelps, Mr. Humphrey and M. A. Brown. 3 ½ mills was levied for tuition purposes on April 20, 1878. In 1879 Milne’s Arithmetic was accepted as the official text for Arithmetic. At this time the amount for tuition was standardized at $180 for each sub-district. Evidently they were having trouble making changes to the Eclectic Series of Books which had been recommended in 1879 so they enforced the use of these by Dec 15, 1880. It did not say what the method of enforcement was. On Mary 7, 1881, they decided to introduce patent seats and desks and furnish all schools with them. The committee was A. H. Bolinger for #1, J.P. Sherlock for #2, C.C. Andrews for #3. Nathan Silvey represented #4. John Wainwright represented #5. J.C. Melick was for #6. Jasper Wickersham was the one for #7. Emmett Newton of District #8 and J.H. Ludman for #10. W.S. Williams for #11 and J. E. Phelps for #12. The ones who voted “NO” were: J. P. Sherlock, and W. S. Williams. Evidently there were strong feelings about using standardized desks and seats that were not hand made in the township. Emmett Newton made a motion to use the same fashion desk and demanded a vote in 1881. The votes were 9 Yeas and 1 Nay. The clerk of each sub-district was to sell old desks to best advantage. Surplus seats were to be left at Oliver Tuckers on or before April 14, 1882. Mr. Joseph Stevens was admitted as a member form #9 after they reexamined his credentials. Most of the districts were unable to sell their old seats. A motion was made to paint all the school house roofs with elastic paint but it lost. J.C. Melick made a motion to purchase Webster’s Unabridged Dictionary for each school to be paid out of contingent fund. J K. McGashan of district 1 voted yes. C.C. Andrews of #3 voted yea. J.C. Melick of #6 voted yea. Jacob Stiers of #8 voted yea and Joseph Stevens of #9 voted “No”. S.C. Mitchell voted yea for district #11 and J.C. Phelps was favorable and from #12 but not entitled to vote. The other missing votes were not represented at the meeting. In 1883 they rescinded the use of the Webster’s Dictionary. A Roll call in April 29, 1884 : 1—J.W. Phillis. 2—J.B. Conn. 3—James Dearth. 4—J.H. Dearth. 5--Stillman Sanders, #6 --John Smith, #7--.R. Moore, #8 --S. H. Humphrey, #9--J.S. Jordan, #10. -___ Devitt 2nd. # 11-- W. S. Williams, #12 was not represented. J.T. Taylor, clerk. They appointed W.H Baker as director of school #2 when John P. Sherlock died. The 1885 board consisted of: M. Smith, W.H. Baker, T.F. Carroll, J.H. Dearth, Stillman Sanders, John Smith, Robert Moore, S.H. Humphrey, J.L. Jordan, John Devitt, W. L. Peregoy, J.E. Phelps. School #12 was to build a coal house, privy and fence and drop 2 rods of fence on each side, but in Sept 1885 they decided not to drop the two yards of fencing. Other specifications for the new Hackney School: 3 sills to be 8’ by 8” one to be through the center of the building and framed so the top of it would be 2 inches below the top of the other sills. The roof was to be covered with the best sea green slate 14 by 24” inch. The floor was to be oak and not to exceed 5 inches width and to extend under the rostrum. The rostrum was 6 feet wide and 7 inches high across the front of the room out of matched lumber. Window frames to be box and sash to be hung with weights. Half rolling blinds were to be added to windows to be 1 3/8 inches thick. One was to be 1 ¾ inches thick. The transom over the door was to correspond with the height of the windows. The room was to be wainscoted with oak 4 inches wide and to extend up to the bottom of the windows which are 3 feet from the floor. There was also to be a strip to extend around the room 6 feet from the floor 5 inches wide to be made of oak. The black board was to be 4 feet wide and extend across the end of the room and to be of wood and painted with slated pain. All the inside work was to be filled in and finished in oil. Three coats of white paint on the outside mixed with lead and linseed oil of the best kind was to be used. The belfry was 4’by 4’ wide and 6 feet high from the comb of the roof. A stove was to be placed 12 feet from the door and the time limit for building was to end on November 10 1886. On September 20, 1886, a motion that the board pay $30 for the land running 10 rods along the old ground and 12 rods along Unionville Road was carried. The board borrowed $592. to pay for the school house and the clerk of #2 district was to advertise the sale of the old house. Bonds issued for 1 year at 6% interest to: Mr. E. Cowles $200, Ercie Pilkington purchased one for $150, Jessie E. Rowland got one for $100. A.W. Burlingame bought one for $14. Thomas Kane and Company assisted with some of the project. On April 18, 1887 A bill was presented for district #11 from N. Silvus for $1 and it was accepted. The board borrowed $195 from the contingency fund to pay off the remainder on the Hackney School. A motion to redistrict the twp in the future was made. On May 14, 1887, a committee was appointed to examine the Centerville School House , as it was in need of plastering and other work. The plastering needed would take 47yards o, three windows, 3 half windows, flooring, and a new door were recommended by the committee consisting of E. Parcell, John Wainwright, W. Crosser. Next a committee was appointed to examine #7. It was said that the house was small and that the floor needed underpinning. E.D. Parcell and Frank Taylor were the committee. The committee of three to examine redistricting question were: W.P. Crosser, E.A.E. Smith, J.P. Taylor. It was suggested that they buy land from Jacob Winestock (3/4 acre) parallel to the other land already to pay him $50 per acre. From school #1 D.L. Morris made a motion to give Centerville School a fine shingle roof. The redistricting committee was discharged without a report because there was such controversy. They decided to let the people vote on it in the spring. Thus endeth the board minutes from 1863 to 1888. Any variance in spellings of names was copied as I saw them from the old books and newspapers of that time. If anyone knows about or has pictures of any of the other schools, I would be most grateful to obtain a copy and thus be able to share a complete set with all who are interested or once attended these houses of learning. 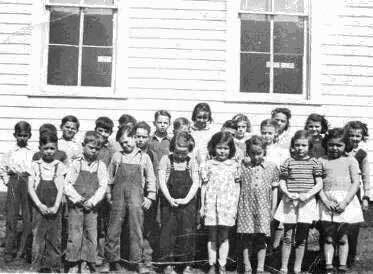 This picture of Early’s School in 1926 is from Marie Duncan who wrote an article in the Morgan County Herald about it in 2003. Morgan County Weekly Herald May 6, 1937. New teachers hired: Miss Alice Gorrell Centerville, Hugh Mahoney, Earlys, Curtis Clark, Hackney. .
August 22, 1937 The fourth annual Early’s school reunion was held at the school with a basket dinner. Mrs. Nellie Morris was the secretary. Mr. Dave Welch, Bennie’s brother , taught at Earlys in his first terms in 1878. He was 18 years old. He visited this locality for the reunion . He has settled in Iowa. In 1937 the Herald announced a PTA meeting at the Hackney School House.